​The origin of new species has been one of the main focuses of evolutionary biology since Darwin’s time. It was classically approached from population genetic and ecological perspectives, but recent advances have brought developmental biology into the picture. Plants, and particularly the extraordinary diversity of flowering plants, provide excellent opportunities to address these questions using the tools provided by 21st century biology. In a new review paper in Nature Ecology & Evolution, we explore the contribution of evolutionary developmental biology (evo-devo) to our understanding of plant speciation. To get a complete picture, we look at speciation at different levels of magnification (or evolutionary scale). We start at the macro scale, by examining the potential developmental basis of large-scale speciation patterns. This includes the origin of evolutionary innovations involved in bursts of speciation (such as the flower) and the intriguing uncoupling of species diversity and morphological disparity in the fossil record. We then look at evolutionary changes in developmental processes underlying reproductive barriers and phenotypic differences between closely related species. In flowering plants, this notably includes conspicuous changes in floral traits linked to pollinator specialisation, such as corolla colour, floral tubes and nectar spurs, as well as changes in breeding system, flowering time and leaf shape. In some study systems, developmental differences arising during speciation have been dissected at the organismal, cellular and molecular levels, for example in closely related species of Petunia with contrasting pollination syndromes1 (Fig. 1). Fig. 1. 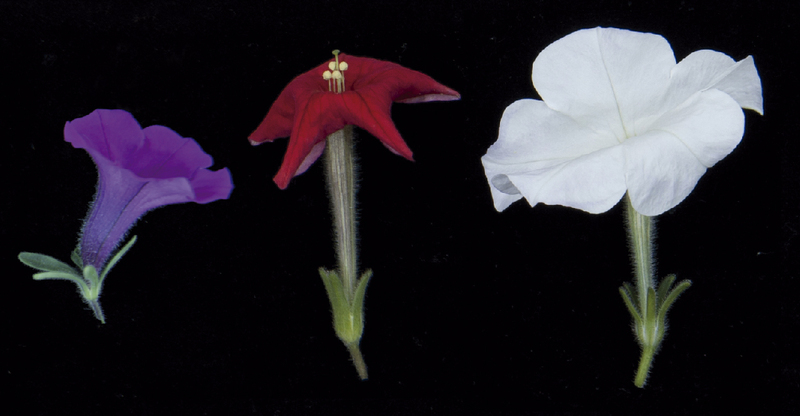 Three closely related species of Petunia exemplifying transitions in flower tube length, stigma exsertion and colour associated with pollinator shifts. From left to right: P. inflata (bee-pollinated), P. exserta (hummingbird-pollinated) and P. axillaris (moth-pollinated). Photos reproduced with permission from H. Sheehan. To truly understand speciation, it is also necessary to examine the process as it is happening. Micro-evo-devo studies look at the intra-specific developmental variation providing the raw material for adaptation and speciation. In the sticky monkey-flower Mimulus aurantiacus, for example, floral colour variation is involved in pollinator preferences and incipient diversification2 (Fig. 2). While most studies investigate simple genetically-based variation, we are now starting to understand the importance for speciation of other components of variation, including phenotypic plasticity and epigenetic variation. Fig. 2. Floral colour variation associated with pollinator preferences between a red-flowered ecotype (preferred by hummingbirds, left) and a yellow-flowered ecotype (preferred by hawkmoths, right) of Mimulus aurantiacus. Photos reproduced with permission from M. A. Streisfield. We advocate a stronger interaction between developmental biology and different areas of evolutionary biology (phylogenetics, population genetics, evolutionary ecology, paleontology). Through this communication and the study of additional systems at different evolutionary scales, we will achieve a higher level of understanding of plant speciation. 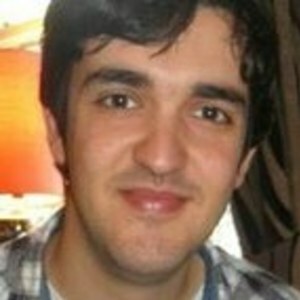 1 Sheehan, H. et al. MYB-FL controls gain and loss of floral UV absorbance, a key trait affecting pollinator preference and reproductive isolation. Nat Genet 48, 159-166 (2016). 2 Streisfeld, M. A., Young, W. N. & Sobel, J. M. Divergent selection drives genetic differentiation in an R2R3-MYB transcription factor that contributes to incipient speciation in Mimulus aurantiacus. PLOS Genet 9, e1003385 (2013).